It’s winter, and the days grow shorter. Well, that’s what we say anyway, but a winter day is still 24 hours long, it’s just the number of daylight hours are fewer. That affects our circadian rhythms, our internal body clocks. With fewer daylight hours, our brains increase production of melatonin, a hormone that makes us sleepy. So, if you’re feeling a little drowsy at work post-holidays, you’re not alone. Well, there’s a nap for that. 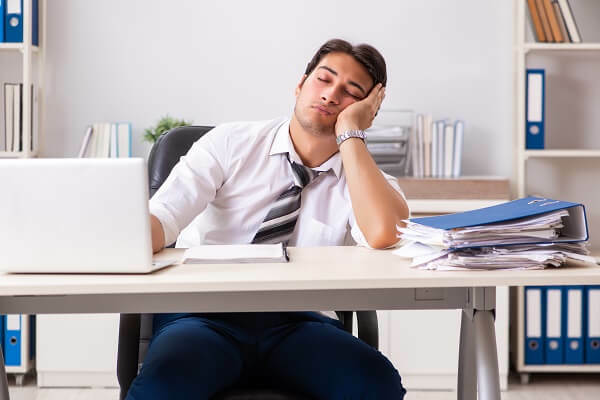 We in the bedding business never tire of that pun, but if you’re a shift worker and you can take a quick 10- to 15-minute nap before work, there’s a good chance you’ll be more alert for the entire shift. Here are some other helpful (we hope) tips to help you stay alert on the job during the winter months. Go for a walk before work. Not only does the exercise get your blood pumping, but the additional exposure to daylight tells your body clock it’s time to be awake. Keep your workplace well-lit, with the windows open for that extra daylight exposure. Too much standing or sitting for long stretches doesn’t help with alertness. Take activity breaks, get up, walk around, or try these desk exercises. If you’re a caffeine drinker, consume it early in your shift, then switch to water. It’s healthier and dehydration can make you less focused on work tasks. Stock up on healthy snacks such as peanut butter and whole wheat crackers, granola and yogurt, nuts and fruit. Stay away from the sugary stuff. If you’re tired at work (no matter the season), you’re probably not sleeping well at home. There are things we can do to remedy that too. First, make your bedroom a sanctuary for sleep, an escape from the stresses of the day. That means ditch the devices. The blue light emitted by our computers, smart phones, and TVs tricks our brains into thinking we should be awake. Better to read a book as you doze off. Try to go to bed and get up at the same times every day, even on weekends. Avoid stimulants, smoking and alcohol before bed. Alcohol, while making you initially drowsy, eventually interrupts and fragments your sleep. It’s 2019, a new year, a time when many of us resolve to improve, to turn bad habits into good habits. If you’re not sleeping well, if you’re struggling to stay alert at work, try these simple tips and make them habits. If that doesn’t help, see your doctor. If you think your sleep problems are the result of an old or uncomfortable mattress, see us.